Modern urban travelers are transformed in a new take on stories from the Brothers Grimm. Photo by Charlotte Watts. "Grim, Grimmer, Grimmest: Tales of a Precarious Nature," the latest Theater Emory production opening Thursday, Nov. 8, follows a current trend of innovative approaches to creating theater. The play, which runs through Nov. 18 at the Mary Gray Munroe Theater, takes modern, urban travelers into the shocking, forbidden and magical stories of the Brothers Grimm and drops them into places of disequilibrium and transformation. 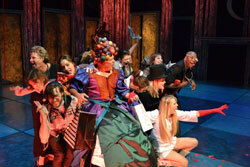 "Grim, Grimmer, Grimmest" was conceived and directed by Theater Emory's artistic director, Janice Akers, originally developed in the 2011 Brave New Works festival on campus. 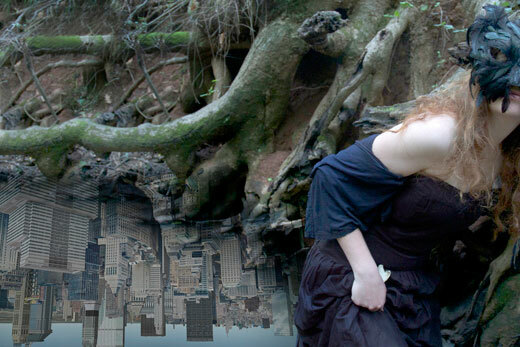 The characters are portrayed by an ensemble of five professional and nine student actors, who find themselves in compelling tales, "wrestling not only with the beast in the woods but with the demons inside of themselves," says Akers, "We are on a path to creating a piece that feels both primal and industrial, a world in which there are sudden and inexplicable events, both outside the characters and in their interior lives." " 'Grim' has been a unique project to work on," says actor Nicholas Surbey, communications coordinator for Emory College Center for Creativity and Arts ('10C). "We started rehearsal with a concept and text from different stories, and worked together as an ensemble, under the guidance of our director, to put together a completed show." "The resulting play doesn't have a traditional structure or chronological story line, but rather explores the intense complexity of experience reflected in these children's stories. We can go from being totally terrified and lost in the woods, to finding ourselves magically transported into something manically funny. Everything can change in a moment, so the drama of the evening really comes from waiting for the next extreme shift," Surbey adds. Performances of "Grim, Grimmer, Grimmest" are Nov. 8-10 and 14-17 at 7 p.m. and Nov. 11 and 18 at 2 p.m. in the Mary Gray Munroe Theater of the Dobbs University Center. Tickets are $20 general admission, $16 discount category members, $6 Emory students and may be purchased at the Arts at Emory box office at 404-727-5050. For more information, visit theater.emory.edu.